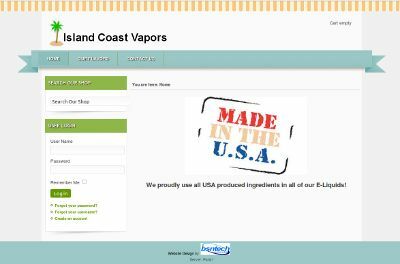 BsnTech Networks was contacted by Tom, owner of Island Coast Vapors. He wanted to start an online business selling an assortment of flavors for eCigs. Upon understanding Tom’s requirements, we started on his site right away. In less than a week, we had his website up and running. We also assisted him with providing an payment card processor since PayPal does not do business with these kind of companies based on what he told us. We apprecoate the business from Tom! The Island Coast Vapors website is at islandcoastvapors.com.